Urticina eques is a species common in European and northern seas, but not occurring in Pacific. For a long time this European species was known as Urticina lofotensis (or Tealia lofotensis, or Tealia felina lofotensis) until Manuel in 1981 synonymized Urticina lofotensis and Urticina eques, and since Urticina eques is an older name, it become valid name of this species. 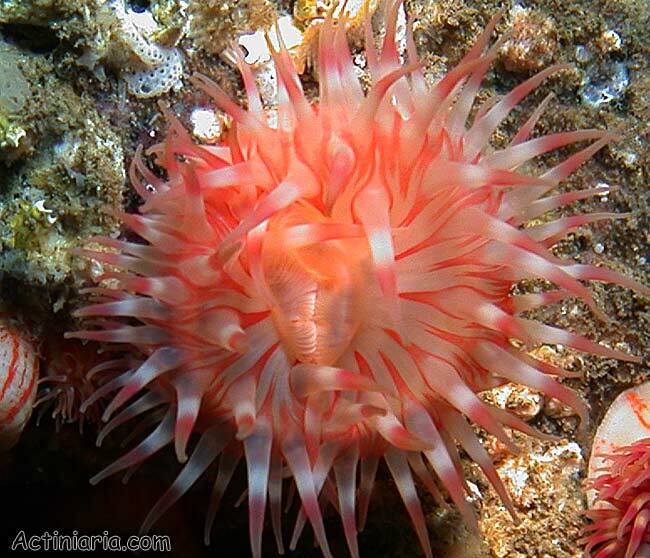 Note, that Pacific species commonly called Urticina lofotensis has nothing in common with this species. Pacific "Urticina lofotensis" even is not an Urticina and belongs to a genus Cribrinopsis. According to recent revision valid name of Pacific species comonly called "Urticina lofotensis" is Cribrinopsis albopunctata. Externally this species resembles Pacific anemone Urticina grebelnyi (which has much better developed nonadhesive vesicles on column and also differs in internal features). Urticina eques differs distinctly from another European species Urticina felina: Urticina felina is usually buried, occurs in crevices, has the body densely covered with large strongly adhesive veruccae to which gravel and other particles are attached. Third European species (occurring also in North Pacific), Urticina crassicornis, always has absolutely smooth body. (Note, that verrucose [not smooth] Pacific species which is often called Urticina crassicornis belongs to Urticina grebelnyi, but not to Urticina crassicornis). Many specimens of Urticina eques have whitish or yellowish ground colour with wide or narrow, irregular, mainly longitudinal red patches. In some specimens the prevailing colour is red. 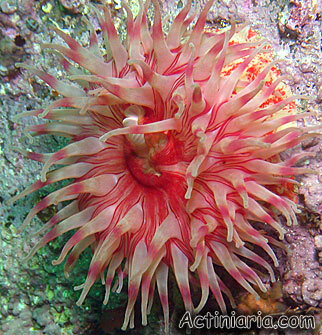 Small nonadhesive verrucae are distinctly visible on the living specimens, especially on the contracted anemones. 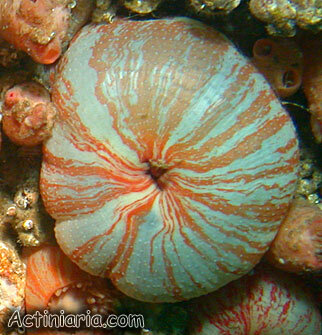 The verrucae are of the same colour as the column or paler, and they probably do not become as inflated and blister-like as in Pacific species Urticina grebelnyi. The oral disk and the tentacles are yellow-whitish, transparent, with the red longitudinal bands outlining tentacle bases on the disk; the tentacles are encircled with the wide white and red bands in the middle.